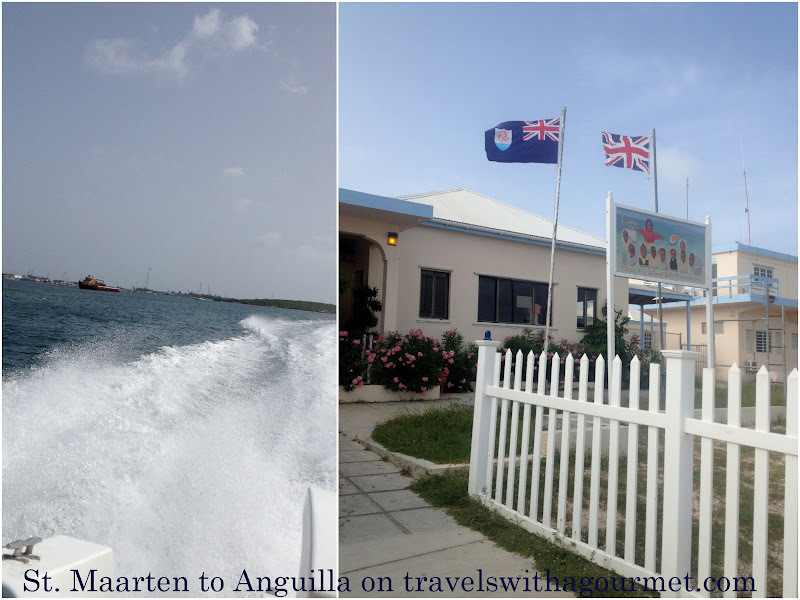 Getting to Anguilla isn’t that simple. There are direct flights from San Juan to Anguilla but it’s on small propeller planes so we opted to go on JetBlue via St. Maarten making the journey in a plane, a boat and two immigration checks (in St. Maarten at the airport and in Anguilla at the dock) then finally, a short taxi ride to the Viceroy Anguilla. We arrived on a beautiful sunny Friday afternoon and went straight to our home for the weekend – a Sea Cliff House right on the water with a clear view of the Mead’s Bay’s turquoise waters. 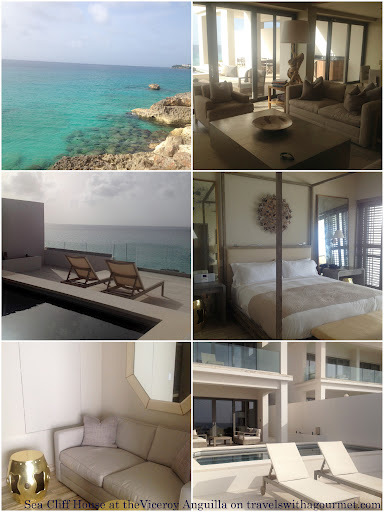 The accommodations at Sea Cliff House were luxurious – three bedrooms (two on the upper floor and one on the ground floor), a study, large living and dining area, fully-equipped kitchen and a large terrace with a barbeque grill, plunge pool and table. Interiors are by designer Kelly Wearstler and are in muted shades of beige, white, grey and “greige” punctuated by funky accessories, gold garden stools, driftwood lamps and cowhide rugs. 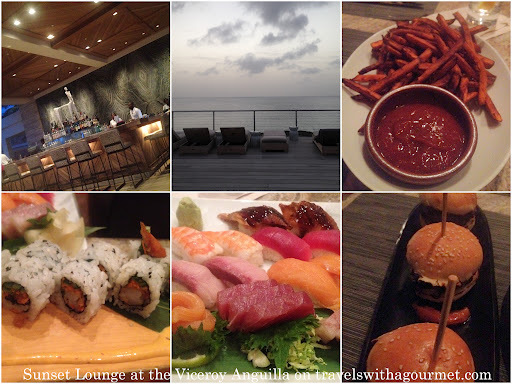 After freshening up and unpacking our mini suitcase, we headed to the Sunset Lounge for a quick dinner at the bar. We settled into a corner of the big square bar and started off with some edamame and crispy spicy plantain chips with mango chutney dip then had some sushi, soft-shell crab rolls and tempura rolls as an appetizer followed by a cheeseburger slider each (three in a plate) with some delicious sweet potato fries. Perfect bar food for a Friday evening. By the time we finished our dinner, the Friday night movie was about to start – Vicky Christina Barcelona – which we skipped to head back for an early night in at our fabulous residence. Bright and early the next morning, we had a quick breakfast at Aleta then walked over to Meads Bay beach which is at the other end of the hotel. The waters were clear (like a swimming pool) and calm and the sand was powdery white. I had only ever seen another beach like this in Boracay (the south of the Philippines) and finally realized why Anguilla was so special. We sat in the shade till lunch time then walked on the beach following the coastline towards the other end where we had lunch al fresco at Blanchards Beach Shack (more on that on my next post). We walked back to the hotel afterwards and cooled off in the swimming pool before checking out the hotel’s kid’s club, NBA court and rock-climbing wall. I had a quick reflexology at the spa then went back to the room for a rest before sunset drinks and dinner. 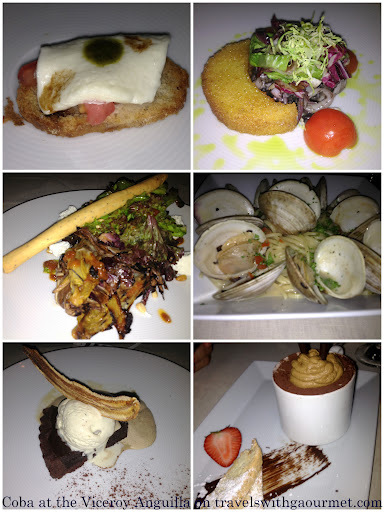 On our second evening, we had dinner at Coba which has a fantastic location right on the bay. The menu is classic Italian. We had the roasted endive and goat cheese salad and the squid ink and polenta to start then had pastas: fettuccine bolognese, gnocchi and spaghetti vongole for our main course. We finished off with the dark chocolate tart with banana ice cream and an amaretti tiramisu with illy espressos. 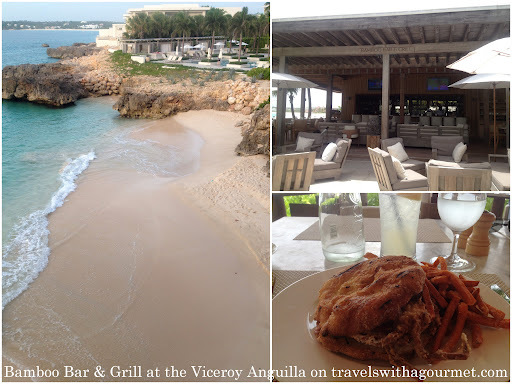 Sunday morning was spent enjoying our last hours in Anguilla and lunch on the beach at Bamboo Bar & Grill where we had superb sandwiches – crispy soft-shell crab with caper mayonnaise and the grilled prawn and slaw – both served on crunchy buns with a side of those addicting sweet potato fries. A quick ride to the dock, another fast boat to St. Maarten and a short flight back to San Juan and just like that, our weekend in paradise was over.